Keeping mobile devices charged and having good connectivity are two things that can be big factors when you’re traveling – especially when on the road for work. 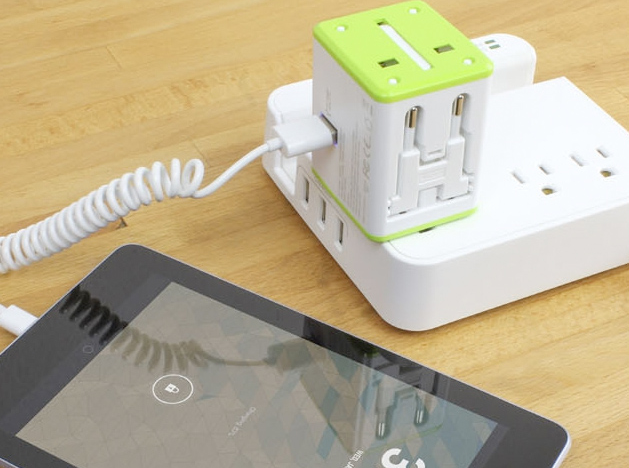 The Smart Travel Router, a globally compatible router and charger combo device, looks like one heck of a nice travel companion. And it’s 30% off as our featured iPad Insight deal right now – so you can garb one for $34.99, down from its standard price of $50. The Smart Travel Router fits electrical outlets in over 150 countries including the US, Canada, Mexico, England, China. It works as a charger for any electronic device, and is capable of charging two 2 devices simultaneously via a USB port as well as an AC output. All prongs easily retract to make it a breeze to carry this handy device around in your purse, laptop bag, backpack or briefcase. Router: In this mode, it functions as a typical router, connecting to the internet provided by your ISP and broadcasting a wireless signal. Repeater: This mode allows you to connect to you existing network and amplify it. This enables you to extend the range of your wireless network. Access point: This configuration allows you to create a wireless connection from a wired source. If only an Ethernet port or Ethernet cable is available, the router can connect to the wired connection and broadcast a wireless network. Client: This mode allows you to connect a device such as a Smart TV or video game console via an Ethernet cable. The Smart Travel Router can then be used as a wireless adapter, enabling the connected device to connect to the internet wirelessly. You can see more detail and place an order at this iPad Insight Deals page.